There are many things about this plot that are not new — an amnesiac hero who’s a dangerous political hot potato, who’s really from a distant star system and is a prince disguised as an ordinary man. These storylines are common in science fiction, fantasy, and even in magical girl/boy manga. But there’s an elegant simplicity to Hamilton’s novella that is only simple because of his elegant writing. Hamilton not only keeps you turning pages but also produces some wonderful turns of phrase which allow you to see into the vastness of space. Neil Banning, our hero, thinks that he’s an ordinary man but quickly discovers that he is not. He spends the entire book torn between his remembered identity as an Earthman and his actual identity which is a great deal more. (I won’t spoil it for you any more than I already have.) The fascinating part of the character’s struggle is that, having been forced into a new identity by his enemies, Banning is able to break free from his old patterns and becomes a better man in the process. Is this because he’s experienced life on Earth as an ordinary man? Or is it because, after breaking free from his heritage, he’s now a wiser man with a much broader vision? In the end it doesn’t matter. What does is that Banning’s become more compassionate after his ten-year exile on Earth and this is something that makes for a great hero. Sure, his original identity was a super rocket-jockey with unearthly retainers and a fantastical lineage. But that’s just the dressing. Banning still has all those things even though he doesn’t remember most of it. He doubts himself and the reality of the situation but must rise to the occasion in order to save the day. To me this is what makes a great pulp hero and a great pulp story. 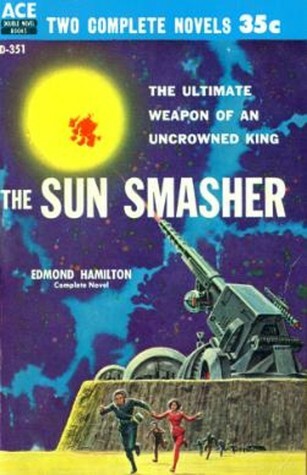 The Sun Smasher is that. It may not be the grandest story that Hamilton ever created but it is a solid bet for an enjoyable read and is highly recommended.